Lightly coat the entire pork shoulder with olive oil and mustard to tenderize the meat. Cover the coated pork shoulder in foil and refrigerate for at least one hour, preferably overnight. Right before cooking, apply a coating of your favorite dry rub over the pork shoulder. Prepare the Caliber Pro Kamado Smoker by filling the blaze basket accessory with lump charcoal. The basket should sit on the charcoal plate at the rear of the smoker with the hinged part of the grate above it for easy access. Bring the temperature of the smoker up to 225ºF. 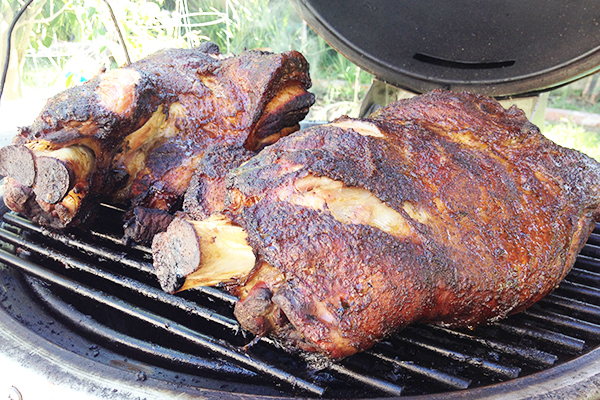 Once the temperature has settled (200-225ºF), place your pork shoulder directly on the top grate. Now, add a small handful of apple and pecan smoking chips to the blaze basket and close the lid. The smoker will “smoke” for the first 30-60 minutes of the cooking process, and after this time, there should be “clean” heat exiting the top vent. Too much time with “smoke” may impart a bitter taste into your meat. Continue to cook the meat, checking it every hour or so until the meat is fully cooked (approximately 10-12 hours). Be sure the heat never exceeds 250ºF. Depending on the weather and food weight, you should check the charcoal level in the blaze basket around 4-6 hours into the cooking run to ensure that there is sufficient fuel in the basket. Add lump charcoal, if needed. Once cooked, pull your pork shoulder while it is still warm.